Gordon Amidon, BS 1967, was awarded the American Pharmacists Association Academy of Pharmaceutical Research and Science Takeru Higuchi Research Prize. The international award recognizes the highest accomplishments in pharmaceutical sciences. Amidon, a Distinguished University Professor of Pharmaceutical Sciences at the University of Michigan, lives in Ann Arbor, Mich.
Patricia Kroboth, BS 1971, dean of the University of Pittsburgh School of Pharmacy, received the 2018 American Pharmacists Association Outstanding Dean Award. Kroboth resides in Pittsburgh, Pa.
Frank Maietta, BA 1982, was named vice president of hospice services and managed care development for Niagara Hospice, where he directs the agency’s services and oversees operations. Maietta, who has more than 35 years of health care administration experience, previously served as vice president of managed care at The HomeCare Partners Inc. He lives in Niagara Falls, N.Y.
Ellen Fink-Samnick, MSW 1983, principal and owner of EFS Supervision Strategies, has been named to the advisory board for Reverberation 5.0, a new national collective to empower women over 50 in the workplace. She resides in Burke, Va.
Robert Romeo, BA 1983, joined BS&P Wealth Management LLC as a financial adviser. He has 35 years of experience in comprehensive financial planning and investment management for high-net-worth individuals and business owners. Romeo lives in Amherst, N.Y. 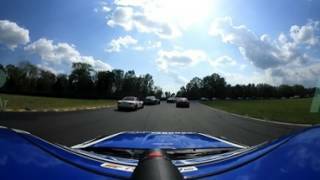 The view from Dinah Gueldenpfennig Weisberg's Miata at Virginia International Raceway ... until the camera falls off. Dinah Gueldenpfennig Weisberg, BS 1987, was promoted to chief executive officer of Redcom Laboratories Inc., a leading telecommunications provider, where she has worked for 32 years. Weisberg began her career at Redcom in 1986 as a summer intern. In her spare time, she’s an avid race car driver and competes with Berg Racing, a business run by her husband, John Weisberg. She uses her race events to raise awareness for Hillside Children’s Center, a provider of care for youth and families with a wide range of emotional and behavioral challenges. Weisberg lives in Webster, N.Y.
Beth Resman-Targoff, PharmD 1987, BS 1973, was recently presented with the Rho Chi Pharmacy Honor Society National Faculty Advisor Award at its annual meeting in Nashville, Tenn., after serving as a faculty adviser to the Gamma chapter for 30 years. She is a clinical professor at the University of Oklahoma College of Pharmacy and resides in Oklahoma City, Okla.
Jon Dusse, MD 1988, joined Eye Care and Vision Associates as eye physician and surgeon. Dusse specializes in diabetic eye care, cataract surgery and oculoplastics, and is a member of the Buffalo Ophthalmological Society. Dusse resides in Eggertsville, N.Y.
Jeffrey Morgan, MArch 1990, joined the Baltimore office of Cho Benn Holback, a Quinn Evans Architects company, as an associate. Morgan brings more than 25 years of experience in complex renovation, adaptive use and historic preservation projects. He resides in Towson, Md. Jennifer Zanieski, BA 1990, was promoted to director of IT user support for Troutman Sanders LLP, an Am Law 100 firm with 12 offices. She’s an active member in the International Legal Technology Association and was recently nominated as a finalist for its 2018 ILTA Distinguished Peer Awards Technology Training or Support Professional of the Year. She lives in Monroe, Ga.
Dexter Johnson, PhD 1995, MS 1989 & BS 1987, became an associate fellow of the American Institute of Aeronautics and Astronautics, a distinction awarded to those who have made a notable contribution to the arts, sciences or technology of aeronautics or astronautics. He was also promoted to Loads and Dynamics NASA Technical Fellow at the NASA Engineering and Safety Center. Johnson lives in Middleburg Heights, Ohio. Richard Weis, BS 1998, joined the Solid Waste group of Barton & Loguidice as a construction manager in the firm’s Rochester, N.Y., office. Weis is a member of the Solid Waste Association of North America, the Mumford Volunteer Fire Department, the Gettysburg Foundation and the Volunteer Fire Police Association of the State of New York. He resides in Mumford, N.Y.
Alicia Hark, BA 2004, and Christine Sugrue, MBA 2015, opened a new studio for their DIY parties and workshops company, StudioHue, at historic 50 Broadway in Buffalo. StudioHue offers a fun atmosphere for DIYers of all ages to create various projects, including pallet signs, etched glasses, welcome mats and more. Hark lives in Cheektowaga, N.Y.
Frank Conjerti, BA 2005, was promoted to vice president of Quinlan, a creative advertising agency in Buffalo, N.Y. He develops client concepts, oversees creative workflow and manages a multidisciplinary creative team. Conjerti resides in Tonawanda, N.Y.
Michael Mancini, EdM 2006, was named chief of staff and secretary to the board of trustees of Thomas Edison State University in Trenton, N.J. In his new role, he serves as the primary adviser to President Merodie A. Hancock and implements the institution’s strategic direction. Mancini lives in Gansevoort, N.Y.
Carol Whitlow, MSW 2006, now retired, is a Red Cross mental health volunteer and travels the country facilitating workshops for individuals in the military as well as those who work in the Red Cross Hero Care call centers. She also provides workshops to military children who have had a parent injured or killed in the line of duty. Whitlow lives in Ithaca, N.Y.
Nora Dooley, PhD 2009, MA 2002, retired after 10 years of teaching American literature and art at St. Bonaventure University. A nontraditional student, Dooley received her PhD at 60, after raising her four children. She also taught freshman writing while taking classes. Now she and her husband, who is also retired after 46 years of teaching at St. Bonaventure, travel the country visiting their children and grandchildren. She resides in Cuba, N.Y.
Brian Salvas, PharmD 2011, was promoted to director of customer and colleague strategy, retail pharmacy operations, at CVS Health. Salvas resides in North Kingstown, R.I.
Akari Iburi, BA 2012, joined the Food Bank of WNY as food drive coordinator. Iburi is responsible for assisting with the organization’s volunteer program, food drives and community relations. She lives in Buffalo, N.Y.
Dan Leake, BS 2012, is a manufacturing production manager at SKF Aeroengine North America in Falconer, N.Y. Leake resides in Jamestown, N.Y.
Molly Harrington, MSW 2013, is a clinical consultant at Vatica Health, serving several primary care offices in the Buffalo area. She is also an adjunct professor of psychology at Erie Community College and an adviser for the Epsilon Mu chapter of Alpha Sigma Tau at UB. Harrington lives in Lackawanna, N.Y.
Christine Sugrue, MBA 2015, and Alicia Hark, BA 2004, opened a new studio for their DIY parties and workshops company, StudioHue, at historic 50 Broadway in Buffalo. StudioHue offers a fun atmosphere for DIYers of all ages to create various projects, including pallet signs, etched glasses, welcome mats and more. Sugrue lives in Buffalo, N.Y.